SAINT PETERSBURG: Neymar broke down in tears, Brazil breathed a sigh of relief and their coach Tite pulled a muscle as he celebrated a last-gasp 2-0 win over Costa Rica on Friday. 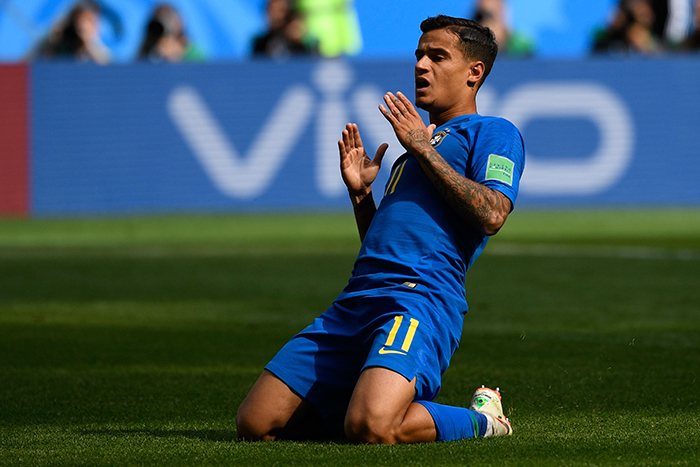 Philippe Coutinho finally broke a dogged Costa Rica´s resistance in the 91st minute before Neymar added a second in the 96th to propel the five-time champions towards the World Cup last 16. At the final whistle, Neymar sat down on the grass and wept, with the emotion of victory hitting home after a tense Group E contest at the Saint Petersburg Stadium. Tite, meanwhile, was left limping, after the 57-year-old reacted to Coutinho´s strike by bursting onto the pitch and tripping over his own feet. Costa Rica looked likely to hold on for a hard-earned draw, particularly after Neymar had a penalty award chalked off by referee Bjorn Kuipers, following a consultation with the Video Assistant Referee. This was only Neymar´s fourth outing since returning from three and a half months out with a foot injury and Tite admitted his star player will need time to hit top form. Brazil will now head into their final group game against Serbia next week confident of reaching the knock-out stages, with four points collected from their opening two matches. Costa Rica, meanwhile, are out but the Central Americans were far from disgraced here. “I don´t know what else we could have done,” their coach Oscar Ramirez said. He faced the most devoted of markers in Costa Rica´s Cristian Gamboa, the Brazilian spending most of the half hopping over scything tackles or dodging past a barging shoulder. There was more drama to come. With just over 10 minutes left, Neymar´s sharp turn prompted Giancarlo Gonzalez to lose his footing and put his arm across the striker´s chest. Neymar arched back as if losing his balance before falling theatrically to the ground. Kuipers initially pointed to the spot but, after reviewing the video replay, changed his mind. Frustration brewed but Costa Rica´s resistance was finally ended in stoppage-time as Marcelo´s deep cross was kept alive by Roberto Firmino and a loose touch by Jesus dribbled perfectly into Coutinho´s path. Six yards out, he sidefooted home. Broken, Costa Rica conceded again right at the death. Firmino drove through the middle before Douglas Costa squared for Neymar finally to find the net.